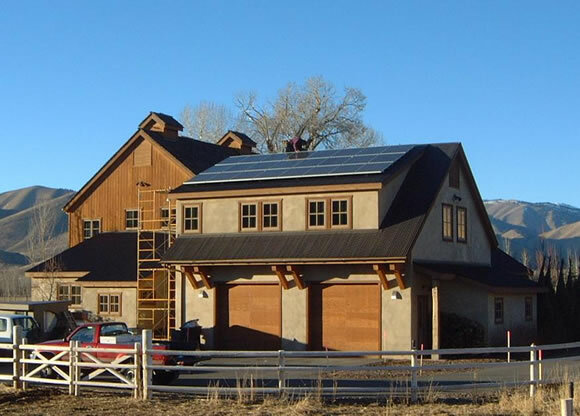 Early this decade, modern inverters became available that allowed solar electric systems to connect up to the utility grid and to the house power panel without using batteries for storage. This greatly simplified and reduced the cost of utilizing solar electricity for mainstream consumers with access to utility power. For these systems, the utility performs the role of a battery - storing extra energy produced by earning credit spinning the meter backwards. The basic components of this type of system are illustrated in the diagram below. Solar electric systems can convert the sun's energy into electricity to power any of the electrical appliances in your home or business. Solar electric panels are made of semiconductor material called photovoltaics (PV). When sunshine strikes the panels it makes electrons move creating direct current (DC) and voltage. 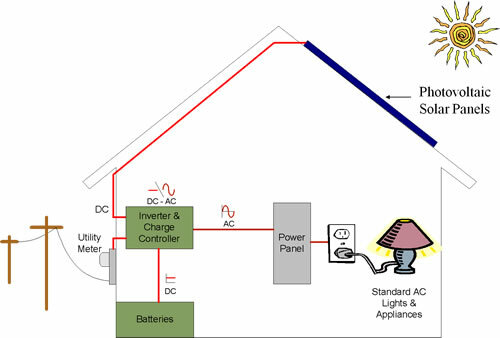 Electric wires connected to the solar panels take the current to an electronic device called an inverter, which converts this DC into the alternating current (AC), the electricity used by most appliances inside a building. If solar panels are generating more electricity than a building is using, then the utility meter spins backwards selling excess solar power to the utility. In this way, owners of solar electric systems are contributing to the local supply of power with clean, green energy - and getting paid for it in the process. Most grid-connected solar electric systems installed have no batteries. When the utility goes down and a power outage occurs, these systems are required by safety regulations to shut down as well. Even if the sun is shining they have no electricity. An alternative is to add batteries and a charge controler that allow the house to be powered with solar energy even when the utility power goes out. Sealed batteries that don't require watering or vented enclosures make this a maintenance fee option. The extra cost of a solar electric system with battery backup depends on the size of the battery bank desired, but it is typically 10% to 25% more.